Lighting ballasts are a key feature of many fluorescent, HID and some LED lamps that allow current to be regulated to suit the lamp type. Without ballasts to control current flow at varying voltages, we’d never see these familiar fluorescents or HID luminaires jump into life - or stay lit for long before burning themselves out. If you’ve ever walked by a standing light fixture or ceiling batten and heard a low humming or buzzing sound, it’s likely that what you were listening to was the ballast doing its job! But what exactly is a light ballast, and what is it doing while you use the light? In essence, a ballast is a type of electrical resistor or reactance, fixed in-line with the circuits that supply mains power to a light bulb. The core role of a lighting ballast is to help control and regulate the supplied current during different operating phases (and voltages) for certain bulb types. Both during their switch-on (peak power draw) phase and in prolonged use (lower, more tightly regulated current), some types of luminaire require an additional component to control the flow of power properly - in short, this additional component is the lighting ballast. When used in conjunction with a dimmer, certain ballast type can also regulate adjustable user-defined power draw and light output levels. This gives fluorescent and HID luminaires the potential for complete dimming functionality, operated much like the dimmer systems regularly found on simpler incandescent light bulbs. How do light ballasts work? For a simplified overview of how a light ballast works as part of a series of in-fixture lighting connectors, think of it as being a two-job component. It gives a boost when we want to arc the light and power it on, then pulls back this initial high current flow to a more sedate level once lit. In a sense, it performs similarly to how a car’s engine works during ignition and subsequent idling. The first important role of the ballast is to ensure that enough voltage is provided when switching on the luminaire to fire it up at the beginning. By allowing mains voltage to supply this initial ‘boost’ immediately after the user flicks a switch, sufficient current is able to jump across and complete an arc between the two electrodes in the lamp, giving light. The second, equally important job of a ballast is to regulate current after this switch-on phase, such that the lamp itself doesn’t continue to draw the full available voltage from mains power the entire time it’s in use. Although various bulb types require an initial boost of electrical current in order to be switched on successfully, allowing them to keep pulling this level of power from the wall for long would mean they very quickly got too hot and suffered serious damage. Without a ballast in place as part of the circuitry, the result would be a bulb that either burned out or shattered almost immediately or - in the best case scenario - suffered a drastically reduced lifespan. There are various lighting ballast types available on the market. These range from relatively simple parts of a light’s inner power loop - acting solely as a basic resistor, capacitor or inductor when wired in-line - to a far more complex piece of the circuitry that’s able to control adjustable voltage and current, giving some HID and fluorescent luminaires fully customisable dimming capabilities. In the sections below we’ll look more closely at some of the different sorts of light ballast available for purchase, and which ones you’ll need for which lighting setups. Standard light ballasts allow for basic safe and consistent operation of the luminaire and its power circuit at lower power draw levels, both during switch-on and in prolonged use. 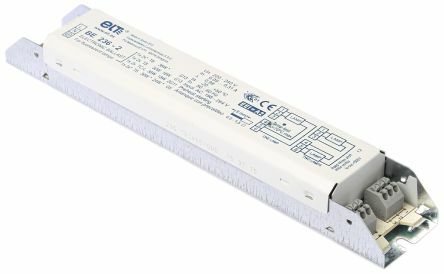 Simple ballasts, such as those found in certain LED or neon lamps, function purely as a resistor to limit the amount of current flowing through a light’s circuit. When a lighting circuit relies on gas discharge, such as those seen powering many workplace fluorescent light ballasts, the luminaires they’re attached to generally draw significantly more power in operation. In these types of circuit, the ballast may act as a reactance element on the interior circuit. This is necessary to allow for the voltage drop across a completed circuit without leading to a runaway increase in flowing current, which would quickly destroy either the lamp itself or the power supply feeding it. LED light circuitry (and its associated driver) tends to be relatively simple, as the far lower power draw of an LED lamp means it requires only a basic resistor to regulate the flow of mains power through its circuitry. However, there are a number of considerations to bear in mind regarding ballasts and LEDs - especially if you’re upgrading by retrofitting LEDs into an existing fixture or system. Do LED lights need a ballast? Whether they’re being used in industrial applications, as grow lights, around the home or anywhere else, LED lamps are generally chosen for their superior quality and consistency of light output - as well as their excellent economy when it comes to long-term running costs. Today, they’re especially popular options for use in downlights and display lighting setups. The cost of the lamps themselves is often higher than for many other types of lighting, but this is usually offset fairly quickly by their vastly increased efficiency in operation. Due to the low power draw, LED lights don’t require a ballast per se - but if you’re looking to swap out your existing fluorescent or HID lamps to take advantage of LED technology, it’s likely you’ll want to insert LED lamps directly into the existing fittings. In that case, you have a few options, the simplest of which is usually a ‘plug-and-play’ format. Rather than a ballast, LEDs technically use a similar but distinct piece of circuitry called a driver - however, some compatible LED varieties are designed to work with the existing ballast technologies found in most fluorescent or HID fittings. All ballasts will eventually fail, and in time you’ll find yourself needing to replace an LED lighting ballast for lamps that don’t technically require one. However, a non-ballast-compatible LED lamp wouldn’t work at all until you’d removed the ballast entirely and wired in the correct driver system, which would usually mean significantly rearranging or replacing the existing fixture. Plug-and-play LEDs tend to be the more expensive systems, but the slightly higher cost of the lamps will still be lower than having the whole fixture upgraded or replaced. Other options include hybrid or linear LEDs, which will work with an existing ballast until it fails, after which they can be line-wired to mains voltage and/or fitted with a driver. Although non-ballast-compatible LED lamps are usually a little cheaper in the first instance, installing them and the hardwiring they require can pose a significant safety risk to anyone not qualified as an electrician, as the sockets will carry live mains voltage if the ballast is bypassed. In most cases, it’s therefore far easier to go with the slightly more expensive ballast-compatible LED lamps for a retrofit job. Then simply continue to replace ballasts as and when required, and enjoy the convenience and safety of a direct like-for-like lamp swap to upgrade your system. For any more information and advice on all kinds of lighting controllers and accessories, contact us via our support pages and we’ll be glad to help out. HID light ballasts work much like the lighting ballasts in fluorescent lamps, with a few key differences that make them a slightly more complex piece of circuitry. Most HID lamps need to power on and off quickly with little or no warm-up time, so their ballasts are designed and wired to allow for very rapid heating and cooling of the gas without causing damage to (or even explosion of) the bulb. In addition, the current flowing to HID lamps needs to be regulated very precisely, as too little is equally bad for the long-term health of the luminaire. HID ballasts also convert DC to AC current where necessary and regulate the flow of electricity within the specific and relatively narrow ranges required by these light types. Electrical light ballasts use induction coils arranged in sequence to control the flow of power through the lamp’s circuitry. They offer several advantages over the larger, usually somewhat cheaper magnetic varieties. Electronic lighting ballasts operate at much higher frequencies than magnetic ones, meaning you won’t see anything like as much flickering (or hear nearly as much buzzing) from a lamp being powered through a properly working electric ballast. When you do hear an audible humming or see a constant flicker from a fluorescent, HID or LED light fitting that’s otherwise operating normally and in good health, it’s a fairly safe bet that there’s a magnetic ballast installed. These control the flow of current at a much lower frequency than an electrical equivalent would, and thus the slight waveform inconsistencies in power delivery become more noticeable. Magnetic ballasts tend to be the older standard for traditional long-tube fluorescent lamps found in many workplaces, often in fittings that haven’t been upgraded in a while. They’re also commonly found in an older workshop or industrial fixtures that have yet to be replaced with newer-style HID or LED bulkheads and drum lamps. Dimmable fluorescent lighting, as well as many of the newer and more compact versions of fluorescent tubes, often require electrical ballasts to function properly. This is due to the more complex requirements of their inner current regulation systems. Electric ballasts are far better at regulating the current flow much more precisely and efficiently, with less audible noise and visible flicker. More efficient use of the power being supplied makes for a smoother user experience when under fluorescent lamps powered through an electronic ballast, meaning they’re usually a much more popular option in home and display use. The longer lifespan of electric ballasts also means that their higher cost can quickly be offset if you regularly need to maintain and replace larger quantities of ballasts and other parts in your fluorescent lighting setup. Replacing a fluorescent or HID lighting ballast isn’t overly complicated, but as ever with electrical circuitry, it’s best left to a qualified professional unless you’re certain you know what you’re doing. Tackling a light fixture ballast replacement requires the following steps, depending on which type of lamp you have installed. When installing wiring or replacing a fluorescent light ballast, first turn off the mains power and/or unplug the fixture from the mains circuit if you’re able to. Next, remove the diffuser plate covering the lamps if there is one. Following this, remove the lamp itself. With the ballast cover removed, disconnect all the wires leading into it, if they unplug. You might like to photograph or take notes of which wire goes where for easier reattachment later. If the wires don’t unclip, which can be the case for some older ballast types, you’ll need to use side-cut pliers or snips to cut through all wiring attached directly to the ballast, leaving a few inches spare. Note that it’s always good practice to make doubly sure the power to the fixture is off, using a non-contact voltage tester before touching wires of any sort. Once all the wiring leading to the ballast is detached or cut, unscrew the ballast itself by loosening and removing the nuts holding it in place, while supporting it with a free hand to prevent it from falling out as soon as it’s loose enough. It’s usually a good idea to keep the old fluorescent light ballast close at hand when sourcing a replacement, to make sure you get a compatible make and model. Once you’ve sourced a suitable replacement, you’ll need to go back through the steps above in reverse order to install the new fluorescent ballast. If the wiring to the ballast was cut during removal, this will mean stripping a short length of the wires’ insulating case to allow for reattachment. Only turn the mains power back on when all of the above steps have been performed in reverse order and the ballast is fully installed. If there’s any problem, be sure to switch the mains back off again (or unplug the fixture from the circuit) before performing any steps to remedy it. Be careful to dispose of old ballasts appropriately - they can contain toxins that are harmful both to you directly, and to the environment if left at unsuitable disposal sites. If in doubt, contact your local council, tip or hazardous waste disposal helpline to find out where best to take them. In many cases, it will be immediately apparent when a fluorescent light ballast needs replacing - often you’ll notice much more visible flicker and/or audible buzzing, the light may take much longer to come on (or only work sporadically), and the quality, colour and consistency of light it emits will be significantly compromised. However, if you’re not entirely sure what’s causing a particular lamp or fixture to behave inconsistently, it’s useful to know how to check the ballast in a fluorescent light and test whether it’s due for replacement. All you really need in order to give a fluorescent tube ballast a quick test is a screwdriver and a volt-ohm multimeter. Follow the steps above for replacing a ballast - again, remembering to disconnect the fitting entirely from the mains before you begin - but stop after you’ve removed the diffuser panel, the tube lamp itself and the ballast cover. Check the ballast visually for any hint of burning, swelling or leaking oil - these signs would indicate it needs entirely replacing. Oil often leaks from a fluorescent ballast when the internal seal has degraded through repeated exposure to high temperatures and started to break down. If there’s no obvious visual evidence of damage, test the ballast wiring with your multimeter on the ohm setting (X1K if there’s more than one option). First, test the high voltage side for continuity between the ballast wires. Insert one probe of the multimeter into the wire connector holding the white wires together, and check for a normal current passing through it by touching the other probe to the ends of the blue, red (and possibly yellow, depending on the type of product installed) wires leading away from the ballast. If all wire pairings on the high voltage side show normal current, move on to the low voltage side and remove the nuts from the wires attaching to the power feed side of the ballast. If the multimeter shows a continuous current when touched to the ends of these wires too, it’s likely the ballast is working properly. If not, it will need replacing. Ballasts for fluorescent, HID and compatible LED lamps can be a source of confusion and frustration for many people, especially in environments where there are a great many fittings and fixtures that need maintaining. Correctly fitted and functioning electrical lighting ballasts should last well and provide safe, well regulated current to the correct type of lamp without the annoying flickering and buzzing associated with older, magnetic or malfunctioning ballasts.